Our wallets may feel a bit heaver these days, due to the current five-year low in U.S. gasoline prices (to under $2 per gallon in some locations). These same low gas prices, though, also produce some unexpected negative consequences. Two new studies demonstrate, specifically, how low gas prices impact transit ridership and property values. A new study from the Mineta Transportation Institute (MTI) finds that public-transit ridership increases when gas prices go up. This suggests that, when gas prices are low, the demand for public transit might suffer. Net Effects of Gasoline Price Changes on Transit Ridership in U.S. Urban Areas is co-authored by Hiroyuki Iseki, Ph.D. and Rubaba Ali, and it expands upon prior studies of the relationship between gas prices and transit ridership. The MTI research shows how rising gas prices increase the demand for transit. This research begs the question: Will falling gas prices result in a decrease in transit ridership? The short answer is: maybe, but not necessarily. Joseph Schofer, a transportation expert at Northwestern University told the Chicago Tribune that people respond differently to a price decrease than they do a price increase. Low or falling prices don’t tend to change behavior so much as high or rising prices. It’s too early, then, to know whether today’s cheap gas prices are causing Americans to forego public transit. But we do know that these prices seem to be inducing them to drive more. The U.S. Department of Transportation reported on January 20 that Americans drove 241 billion miles in November 2014, a 1.1 percent increase over the same month of a year prior. This may sound like an insignificant increase, but as Planetizen reported, it is enough to put the U.S. on track to top three trillion vehicle miles traveled (VMT) in 2014. In other words, unless as-yet-unreleased December VMT numbers are anomalous, then 2014 will have been the first year Americans drove more miles than in 2007. 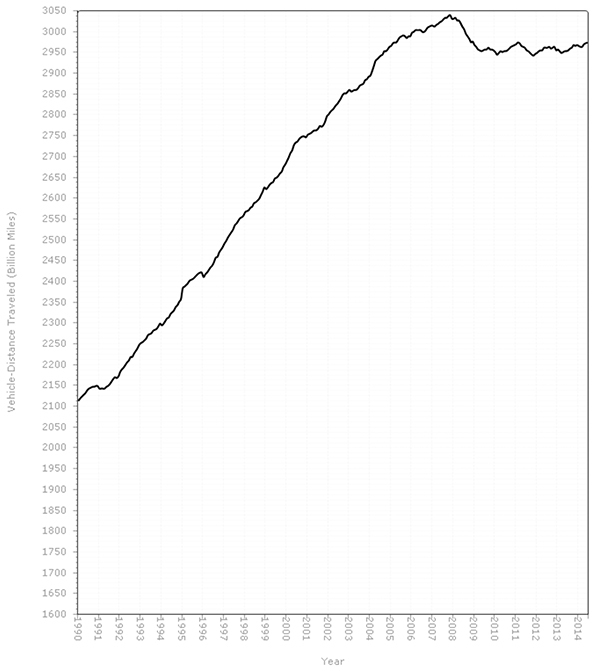 “Peak driving” (or peak traffic, see right) may no longer, unfortunately, be in America’s rearview mirror. The MTI study suggests that low gas prices are one reason for this increase in driving, and may also cause – if not immediately, then eventually – a decrease in transit ridership. 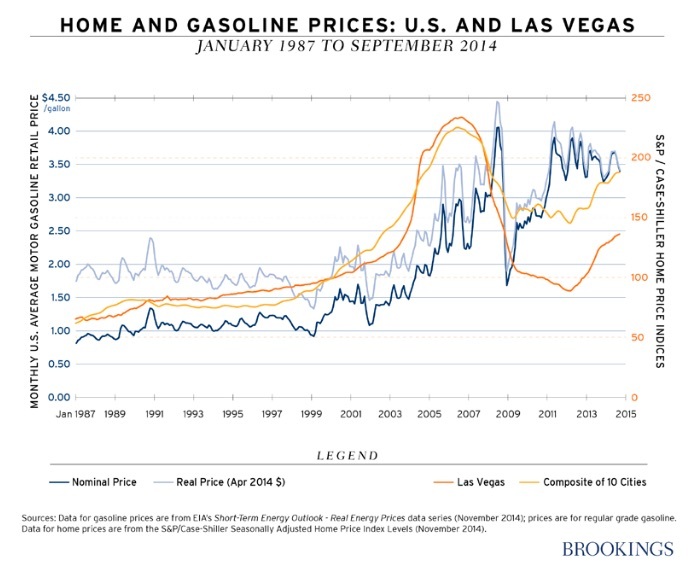 Another new study – from the Brookings Institution – asks: Do Gasoline Prices Affect Residential Property Values? The study finds that a 10 percent increase in gasoline prices corresponds to a shift in the relative value of homes over a range about 2.5 percentage points, or about $13,500. The authors demonstrated that property values close to a city’s center or downtown tend to rise as gasoline prices increase, whereas home values in the city outskirts tend to fall. This implies that our current low gas prices could incentivize Americans to move further away from their places of employment, decisions shown to increase congestion and VMT. High gas prices’ positive effect on the value of housing in the central business district is presumably due to this location being well served by public transit. High gas prices’ negative effect on housing in the city outskirts is likewise presumably due to the higher transportation costs associated with car-dependent locations. Like the MTI study, the focus of Brookings’ research is on the relationship between property values and gas price increases – not decreases. It is harder to predict how the U.S.’s current climate of declining gas prices will affect property values. It may also be difficult to extrapolate the results of Clark County, Nevada to the country as a whole. Nonetheless, the Brookings research is an important first step in determining the relationship between gas prices and property values. Splash photo courtesy Wikimedia. 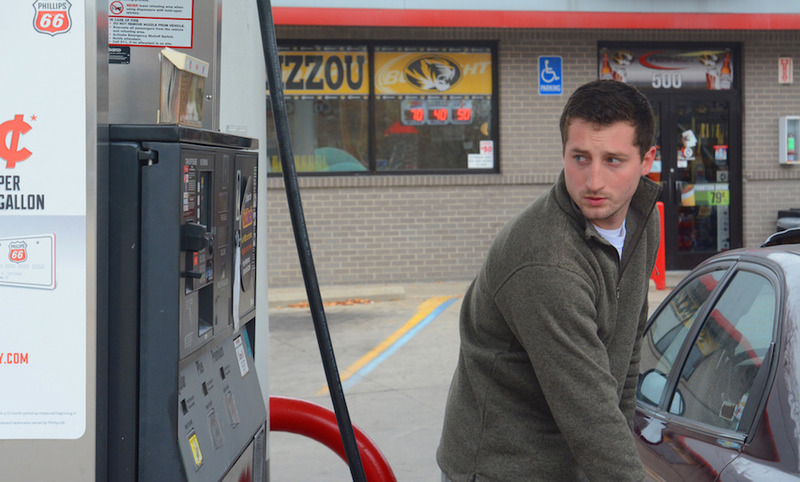 Gas station photo by KOMUnews.